In the film, it was one of my favourite lines delivered by Alec Guinness. I bet he added the “of course” bit himself. Guinness was always marvellous at portraying devious craftiness. Instead, mine looks more like: “Just do whatever you feel like”. I’ve often heard the remark about how the Eiffel Tower can be seen from every apartment window in Paris – in Hollywood movies. 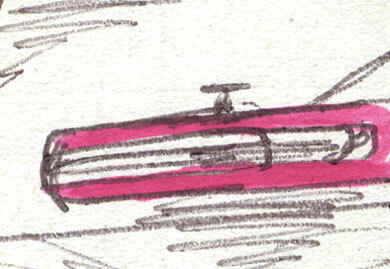 Or is it – like the Landspeeder on this page – some sort of weird mechanical stalker? It reminds me of an animated segment that Terry Gilliam did for Monty Python’s Flying Circus in which a 1940’s English terraced house breaks free of its neighbours and goes on a killing spree. It even silently sneaks up on its victims! Or maybe the Landspeeder just wanted to be on camera? Waving to its mum and dad, or giving the thumbs up, like kids do, behind outside-broadcast news reporters. Hey, the twin suns are doing it too! In the actual film they really had to do a bit of this. For the Rebel Base hangar scenes, they only had a 1 X-Wing and 1 Y-Wing available, so every time they took a shot they had to wheel them about behind the actors so it’d look as if there were loads of them. Funny really! Scarred – scarred I tell you! See the two scars added to Luke’s face? I’ve « discussed these before. I actually added them retrospectively—EVERYWHERE—after I’d seen post-production shots of poor Mark Hamill after his car crash. Usually they were posters that were—er, borrowed from my sister’s magazines. You’ll see more of those scars. Seriously, all through this comic I must have gone about adding them to finished drawings. I wanted to add a bit more authenticity, I suppose. It doesn’t make sense! He suffered the injuries just near the end of the shooting of the film. But you know what? I’m not sure he even did have those two scars! Thinking about it now, they might have just been natural facial creases! Thankfully, Mark survived. Not only that, but he’s going strong and looking fit, shooting the new Star Wars movies – in Ireland of all places! 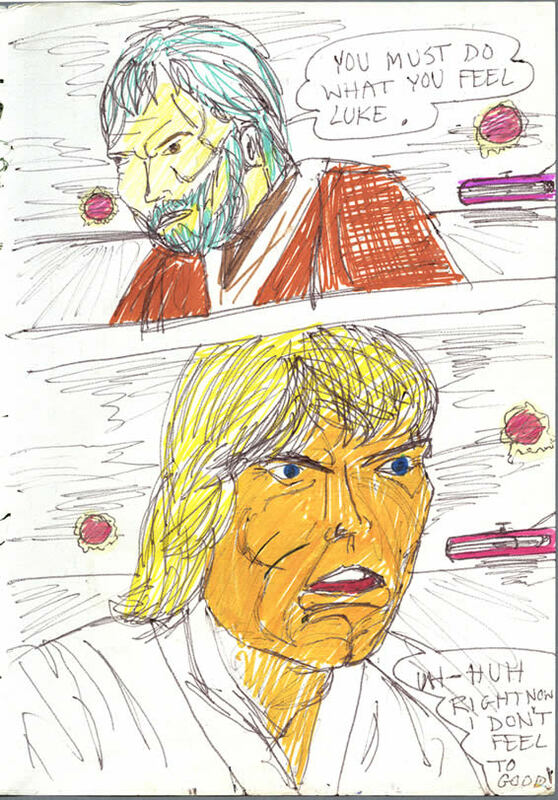 Ben says, "You must do what you feel Luke." "Uh-huu. Right now, I don't feel too good!" Luke replies.